BOTANICAL AND SPECIES TULIPS are native to Europe and Asia; are generally shorter; do better in poor soil; tolerate heat better; and bloom longer than hybrid types. HYBRID TULIPS are generally showier flowers on taller stems and come in a wider range of colors. Hybrid tulips are classed by time of bloom. 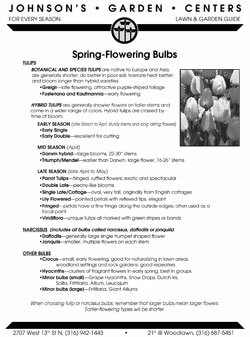 How Many Dutch Bulbs Do I Need? Bulb Type Spacing Planting Depth Bulbs per 100 sq. ft.
For example, if you have a 100 sq. ft. area you want to plant with narcissus, you will need to purchase 400 bulbs. Use these numbers as a guide when shopping ... keeping in mind that this is just a guide. For a more spectacular show, purchase a larger quantity of bulbs. 1. Choose a location that gets full or part sun. You may plant most bulbs from September to December. 2. For best effect, plant bulbs in clusters. Don’t plant in rows ... they will never bloom perfectly straight. It is better to use staggered or random spacing. Try just tossing them in the bed and planting them where they fall. 3. It is best to dig the entire bed area to the proper depth before planting the bulbs. 4. Work in Cotton Burr Compost and gypsum to condition the soil. Good drainage is essential. 5. Mix Hi-Yield Bone Meal into bottom of hole to provide a slow-release fertilizer. 6. Plant bulbs with the pointed end up. 7. Cover bulbs with soil. Use Dutch Bulb Food fertilizer on the surface. 8. Water in with ferti•lome Root Simulator. If the weather is dry, water bulbs once a month through winter as long as the ground is not frozen. 9. Mulch to keep soil moisture in and ground temperatures even. When choosing tulip or narcissus bulbs, remember that larger bulbs mean larger flowers. Earlier-flowering types will be shorter.